When we began our human rights defender training in South Africa by asking participants to give examples of discrimination they faced as lesbian, gay, bisexual, transgender and intersex (LGBTI) refugees, we didn’t expect many people to share. What we heard, however, was an outpouring of tragic events. Participants openly discussed how their partner or friend had been killed and how they had lost their livelihood and homes because of their sexual identity. Some even bore the scars of recent physical assault. We were there to work together to overcome this endemic abuse, and were inspired by their courage because, even in the face of such tragedy, they chose to empower themselves and others. Student Hailey Flynn works with a small group of trainees. A few stories come to mind as we remember the dozens of stories of tragedy and resilience. One participant discussed how she was repeatedly raped and sexually assaulted by her landlord who would threaten to evict her if she didn’t comply with his demands. However, this individual took matters into her own hands and decided to go to the police in order to put a stop to the abuse she was facing. Her efforts to end the abuse paid off and the police finally arrested the landlord. However, many of the other participants did not have such triumphant conclusions to their stories; all of the participants still endure ongoing abuse as a result of their sexual orientation, gender identity and nationality. Facing persecution in their home countries because of their sexual orientation or gender identity, many LGBTI refugees have fled to South Africa in search of a safe haven. Since South Africa’s constitution and domestic laws are liberal and progressive, they believed that these legal protections would provide them with safety from discrimination based on their sexual orientation and ethnic origin. Rather than finding a safe, supportive environment, however, these individuals continue to face discrimination and violence because of their sexual orientation or gender identity and their nationality. 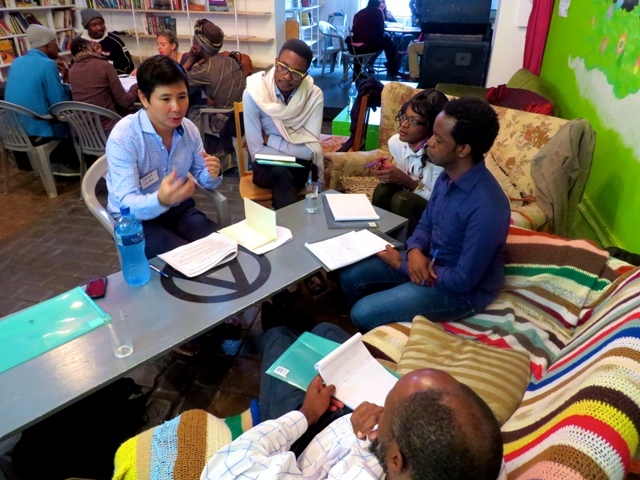 In spite of the overwhelming challenges in South Africa, including physical assault, difficulty in finding housing and work, harassment from both private and public actors, and from living in a foreign country, many LGBTI refugees wanted to empower themselves by learning how they could advocate for their rights and the rights of others in the LGBTI refugee community. 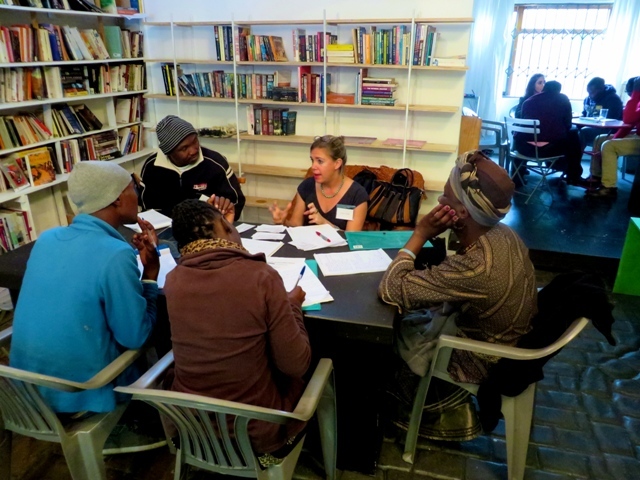 In November 2014, the Walter Leitner International Human Rights Clinic partnered with People Against Suffering Oppression and Poverty (PASSOP), a South African non-profit organization that advocates for refugees and asylum seekers, to conduct a 3-day human rights defender training for LGBTI refugees in Cape Town, South Africa. Supervised by Clinic Director, Professor Chi Mgbako, five students developed a training manual that defined the human rights violations that the South African LGBTI refugee community faces and identified the relevant international, regional and domestic mechanisms to redress these human rights abuses. The manual also includes instructions on how to submit shadow reports or complaints to the relevant human rights mechanisms. Student Takahisa Juba discusses human rights mechanisms during the training. This training enabled the participants to garner practical knowledge about the human rights framework and to understand how to effectively fight for their own rights as well as the rights of their fellow LGBTI refugees. Since all of the trainees had personally experienced human rights violations, these injustices motivated them to participate in the training and work to ensure rights for all. The advocacy skills that the training focused on not only empowered them to fight for their own rights, but also encouraged them to defend the rights of other survivors of human rights abuses. It was an energy-filled three days of training and the participants’ enthusiasm was overwhelming. The first day kicked off with an overview of the human rights legal framework. Then, we dove into the relevant rights that protect LGBTI refugees specifically and covered what international, regional and domestic laws enumerate those rights. To test their knowledge on the material, quizzes and interactive activities were included throughout the training. Participation in these games not only reinforced the trainees’ comprehension of the material, but also fostered a competitive and enthusiastic atmosphere. Despite having rights, these participants knew all too well that many people and institutions often fail to hold perpetrators responsible for human rights violations. As a result, documentation of abuses and demanding accountability are crucial to redressing human rights abuses. A significant portion of the training was dedicated to reconciling what rights LGBTI refugees actually have with the reality of how to enforce those rights when they are violated. We explained how various human rights monitoring mechanisms—including the Human Rights Committee, African Commission, South African Commission on Human Rights, Committee Against Torture, Human Rights Council (the Universal Periodic Review Process and Special Procedures), the United Nations High Commissioner for Refugees and the South African Human Rights Commission—can be used to enforce the relevant rights and how each of these mechanisms can be used most effectively. Showing that there are available remedies and methods of accountability gave the participants the tools to change their circumstances and empower themselves. We also devoted a session on fact-finding through interviewing and non-interviewing methods, which is an essential skill-set for documenting abuses and seeking accountability. Student Urooj Rahman gives a presentation as part of the human rights defender training. With new knowledge and tools in hand, the participants concluded the training by envisioning a brighter future. 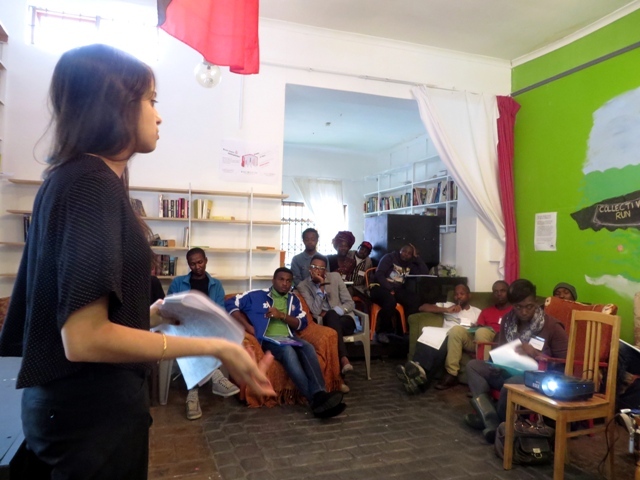 Trainees broke into several groups and designed strategic plans to hold the South African government accountable for protecting LGBTI refugee rights. These plans laid out a framework for addressing specific rights violations through engaging a particular human rights monitoring mechanism. Moreover, they paved a path forward for participants to continue to fight for their own rights and for those of their fellow LGBTI refugees. The trainees left feeling empowered and optimistic, as they were now better aware of their rights and how to protect them. The training also made us realize the importance of human rights work and having the tools to advocate for and with marginalized members of society. It was a moving experience for us to see that the knowledge we shared allowed many of the trainees to feel invigorated to advocate for the LGBTI refugee community. We feel fortunate to have had this opportunity to work with these courageous participants who have had the resilience to stand up for the rights they deserve. Our hope is that our training imparted useful information for their advocacy work, which will allow them to live safer, better lives. We are hopeful that the trainees will utilize the vast amount of information they learned and demand that their guaranteed rights under South African, regional and international law are respected, protected and fulfilled. Hailey Flynn, Takahisa Juba and Urooj Rahman are a 2L student, alumnus and 3L student, respectively. They participated in the Walter Leitner International Human Rights Clinic. Categories: LGBTI Rights, Refugee Rights, Training, Walter Leitner International Human Rights Clinic | Tags: Human Rights Trainings, LGBTI Rights, PASSOP, Refugee Rights, South Africa, Walter Leitner International Human Rights Clinic | Permalink.